A golf swing, when executed properly, forms a smooth and graceful arc; it appears to be a simple movement. But anyone who has ever played golf knows the appearance is deceiving. To hit that tiny ball solidly, every part of the golfer's body must work in perfect syncluï¿½onization. In the past, golfers in quest of that perfect swing turned to golfing instructors for advice. Now, however, they can also turn to the computer-specifically, a computer system designed to capture and digitize motion. Notre Dame football coach Lou Holtz is one of several hundred golfers who has already done just that. For Holtz, it was a success. Simply by using a 3D model of his swing as a guide, he progressed from a 14-handicap golfer to one who shoots just three strokes over par. But Holtz, and golfers in general, are not the only ones benefiting from the latest in motion capture technology. Olympic athletes, medical institutions, horse trainers, computer animators, and engineers have all found that motioncapture systems significantly affect their ability to understand, perform, or design. Bob Cramblitt, formerly of NCGA heads a communications company in Cary, NC. cially available and others still in research labs. Most use similar methods for collecting data. What differs is the graphic output and the way the systems are configured for specific applications. The most common approach for collecting motion data combines the flexibility and convenience of video cameras with the speed and accuracy of computers. The ExpertVision system from Motion Analysis (Santa Rosa, CA) is typical in that regard. The company's 3D system includes up to four cameras, a VCR, a video monitor, a proprietary video processor with multiple camera inputs, a Sun Microsystems' workstation, and a printer. To make it work, the subject is outfitted with as many as 30 reflective markers. Then, when the subject moves, video cameras capture the reflections of light from the markers and feed the information to the video recorder and the Motion Analysis video processor. Data can be collected at a standard video rate of 60 frames per second or at a high-speed rate of 200 frames per second. commands from the user. The VCR is used to archive the video record of the event for later viewing and analysis. and bar charts are used to display such data as motion variables, positions, and orientations. tions: applied mechanics for crash and engineering tests in automotive, aerospace, and military environments; biomechanics for use in computer animation; and applied biomechanics for human gait analysis. analysis of human motion. Systems are being used at General Motors, for example, to analyze vibrations in engine belt drives and water pump shafts. In pothole tests, the ExpertVision system provides data on the motion of wheels, tires, and hubcaps in relation to the body of a vehicle. 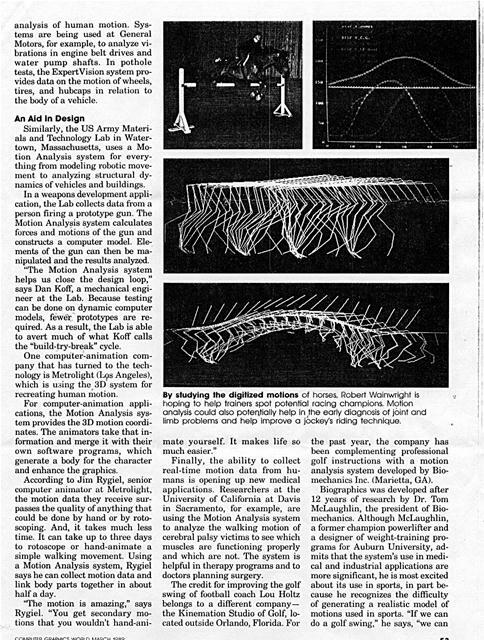 Similarly, the US Army Materials and Technology Lab in Watertown, Massachusetts, uses a Motion Analysis system for everything from modeling robotic movement to analyzing structural dynamics of vehicles and buildings. In a weapons development application, the Lab collects data from a person firing a prototype gun. The Motion Analysis system calculates forces and motions of the gun and constructs a computer model. Elements of the gun can then be manipulated and the results analyzed. "The Motion Analysis system helps us close the design loop," says Dan Koff, a mechanical engineer at the Lab. Because testing can be done on dynamic computer models, fewer prototypes are required. As a result, the Lab is able to avert much of what Koff calls the "build-try-break" cycle. One computer-animation company that has turned to the technology is Metrolight (L9s Angeles), which is using the 3D system for recreating human motion. For computer-animation applications, the Motion Analysis system provides the 3D motion coordinates. The animators take that information and merge it with their own software programs, which generate a body for the character and enhance the graphics. 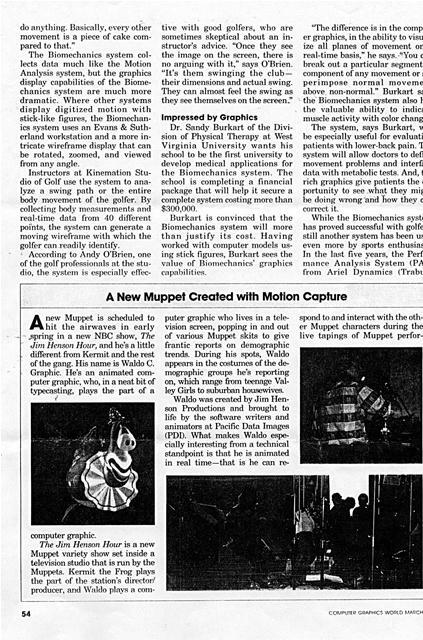 According to Jim Rygiel, senior computer animator at Metrolight, the motion data they receive surpasses the quality of anything that could be done by hand or by rotoscoping. And, it takes much less time. It can take up to three days to rotoscope or hand-animate a simple walking movement. Using a Motion Analysis system, Rygiel says he can collect motion data and link body parts together in about half a day. mate yourself. It makes life so much easier." Finally, the ability to collect real-time motion data from humans is opening up new medical applications. Researchers at the University of California at Davis in Sacramento, for example, are using the Motion Analysis system to analyze the walking motion of cerebral palsy victims to see which muscles are functioning properly and which are not. The system is helpful in therapy programs and to doctors planning surgery. the past year, the company has been complementing professional golf instructions with a motion analysis system developed by Biomechanics Inc. (Marietta, GA). By studying the digitized motions of horses, Robert Wainwright is hoping to help trainers spot potential racing champions. Motion analysis could also potentially help in, the early diagnosis of joint and limb problems and help improve a jockeys riding technique. do anything. Basically, every other movement is a piece of cake cornpared to that." The Biomechanics system collects data much like the Motion Analysis system, but the graphics display capabilities of the Biomechanics system are much more dramatic. Where other systems display digitized motion with stick-like figures, the Biomechanics system uses an Evans & Sutherland workstation and a more intricate wireframe display that can be rotated, zoomed, and viewed from any angle. Instructors at Kinemation Studio of Golf use the system to analyze a swing path or the entire body movement of the golfer. By collecting body measurements and real-time data from 40 different. points, the system can generate a moving wireframe with which the golfer can. readily identify. tive with good golfers, who are sometimes skeptical about an instructor's advice. "Once they see the image on the screen, there is no arguing with it," says O'Brien. "It's them swinging the clubtheir dimensions and actual swing. 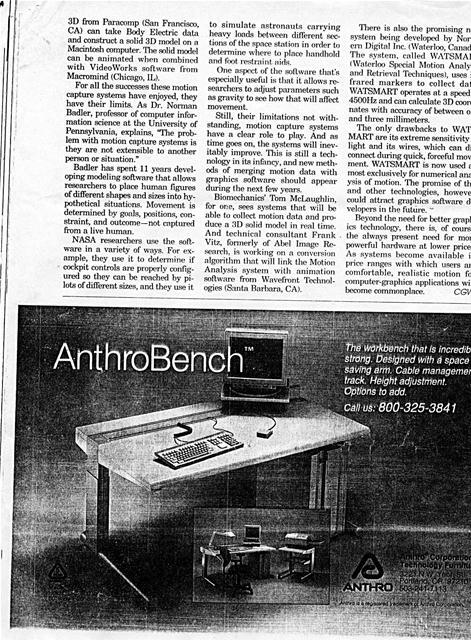 They can almost feel the swing as they see themselves on the screen_"
Dr. Sandy Burkart of the Division of Physical Therapy at West Virginia University wants his school to be the first university to develop medical applications for the Biomechanics system. The school is completing a financial package that will help it secure a complete system costing more than $300,000. Burkart is convinced that the Biomechanics system will more than justify its cost. Having worked with computer models using stick figures, Burkart sees the value of Biomechanics' graphics capabilities. The system, says Burkart, w be especially useful for evaluati patients with lower-back pain. T system will allow doctors to defy movement problems and interfa data with metabolic tests. And, t rich graphics give patients the portunity to see what they mig be doing wrong and how they c correct it. puter graphic who lives in a television screen, popping in and out of various Muppet skits to give frantic reports on demographic trends. During his spots, Waldo appears in the costumes of the demographic groups he's reporting on, which range from teenage Valley Girls to suburban housewives. Canyon, CA) has been used by hundreds of athletes at the Coto Research Center and neighboring Vic Braden Tennis College in Trabuco Canyon as well as by professionals and top amateurs in practically every sport, ranging from football to polo. Developed by Dr. Gideon Ariel, a former discus thrower who competed in. the 1960 and 1964 Olympics, PAS digitizes movement from videotape, and one of its strongest features is that it does not require that the subject wear reflective markers-although that is an option. This makes it an ideal system for collecting data underwater, at athletic events, and in other uncontrollable settings. tify data points accurately, the user can intervene and make changes manually. The realistic computergraphics display produced by the Biomechanics system has helped hundreds of golfers improve their golf swings. mances (bottom photo, this page). Playing a key role in making that possible is the use of motion capture technology. The animation of Waldo begins with the use of a puppet armature manipulated by a puppeteer (opposite page, top rightl. The armature, explains Graham Walters of PDI, "looks like an inverted Luxo lamp." It has six joints, each hooked up with electronic sensors that transmit information about the movement of the joints to a Silicon Graphics workstation. Two other sensors representing the upper and lower jaws control the character's talking and facial expressions. while interacting with the other Muppets as he's manipulating the armature. Because movements captured by motion capture systems are specific to an individual, there is still an important role for systems, such as this one used by NASA, that let users model motion rather than capture it. an especially interesting application is LIFE (Laboratory of Isokinetic Fitness Exercise) in Point Pleasant, New Jersey. There, LIFE's owner, Robert Wainwright, is trying to use the system to analyze the movements of horses in hopes it will. help trainers more easily identify whether or not a race horse has the makings of a champion. 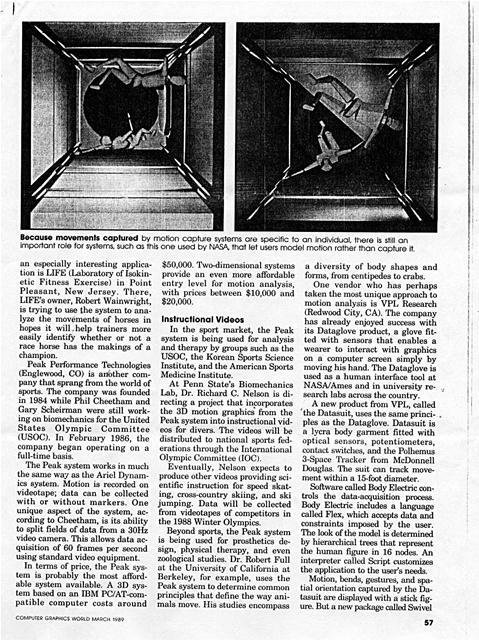 Peak Performance Technologies (Englewood, CO) is another company that sprang from the world of sports. The company was founded in 1984 while Phil Cheetham and Gary Scheirman were still working on biomechanics for the United States Olympic Committee (USOC). In February 1986, the company began operating on a full-time basis. The Peak system works in much the same way as the Ariel Dynamics system. 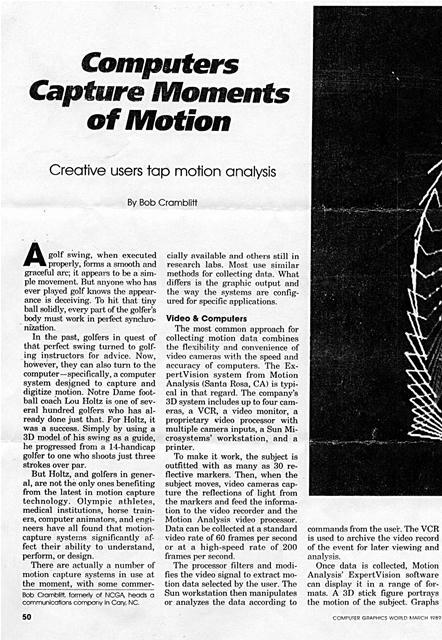 Motion is recorded on videotape; data can be collected with or without markers. One unique aspect of the system, according to Cheetham, is its ability to split fields of data from a 30Hz video camera. This allows data acquisition of 60 frames per second using standard video equipment. $50,000. Two-dimensional systems provide an even more affordable entry level for motion analysis, with prices between $10,000 and $20,000. In the sport market, the Peak system is being used for analysis and therapy by groups such as the USOC, the Korean Sports Science Institute, and the American Sports Medicine Institute. At Penn State's Biomechanics Lab, Dr. Richard C. Nelson is directing a project that incorporates the 3D motion graphics from the Peak system into instructional videos for divers. The videos will be distributed to national sports federations through the International Olympic Committee (IOC). Eventually, Nelson expects to produce other videos providing scientific instruction for speed skating, cross-country skiing, and ski jumping. Data will be collected from videotapes of competitors in the 1988 Winter Olympics. a diversity of body shapes and forms, from centipedes to crabs. One vendor who has perhaps taken the most unique approach to motion analysis is VPL Research (Redwood City, CA). The company has already enjoyed success with its Dataglove product, a glove fitted with sensors that enables a wearer to interact with graphics on a computer screen simply by moving his hand. The Dataglove is used as a human interface tool at NASA/Ames and in university research labs across the country. A new product from VPL, called the Datasuit, uses the same principles as the Dataglove. Datasuit is a lycra body garment fitted with optical sensors, potentiometers, contact switches, and the Polhemus 3-Space Tracker from McDonnell Douglas. The suit can track movement within a 15-foot diameter. Software called Body Electric controls the data-acquisition process. 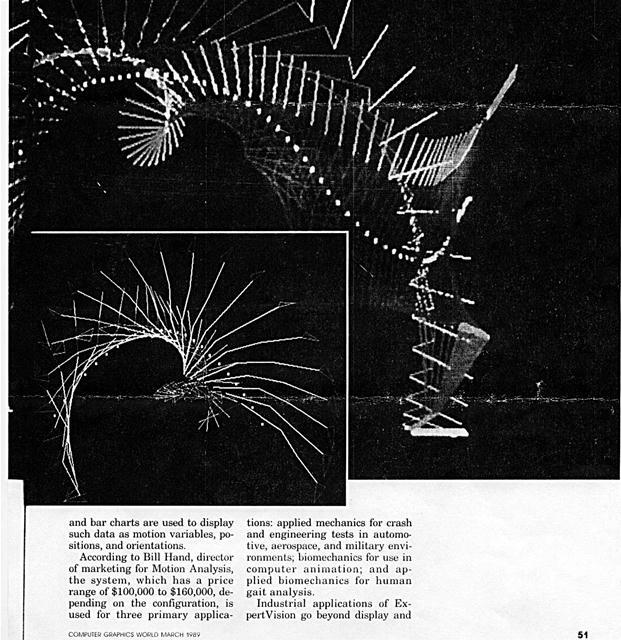 Body Electric includes a language called Flex, which accepts data and constraints imposed by the user. The look of the model is determined by hierarchical trees that represent the human figure in 16 nodes. An interpreter called Script customizes the application to the user's needs. 3D from Paracomp (San Francisco, CA) can take Body Electric data and construct a solid 3D model on a Macintosh computer. The solid model can be animated when combined with VideoWorks software from Macromind (Chicago, IL). For all the successes these motion capture systems have enjoyed, they have their limits. As Dr. Norman Badler, professor of computer information science at the University of Pennsylvania, explains, 'Me problem with motion capture systems is they are not extensible to another person or situation." Badler has spent 11 years developing modeling software that allows researchers to place human figures of different shapes and sizes into hypothetical situations. Movement is determined by goals, positions, constraint, and outcome-not captured from a live human. to simulate astronauts carrying heavy loads between different sections of the space station in order to determine where to place handhold and toot restraint. aids. One aspect of the software that's especially useful is that it allows researchers to adjust parameters such as gravity to see how that will affect movement. Still, their limitations not withstanding, motion capture systems have a clear role to play. And as time goes on, the systems will inevitably improve. 'This is still a technology in its infancy, and new methods of merging motion data with graphics software should appear during the next few years. Biomechanics' Tom McLaughlin, for or:e, sees systems that will be able to collect motion data and produce a 3D solid model in real time. 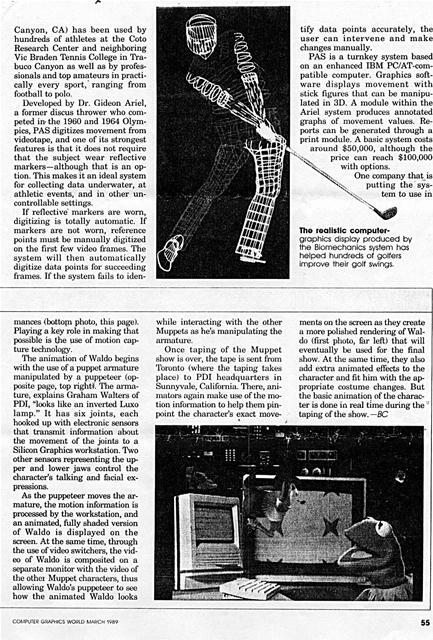 And technical consultant Frank Vitz, formerly of Abel Image Research, IS working on a conversion algorithm that will link the Motion Analysis system with animation software from Wavefi- ont 'l'eclmologies (Santa Barbara, CA). There is also the promising nl system being developed by Nort crl Digital Inc. (Waterloo, Canad. The system, called WATSMAI Waterloo Special Motion Analy, and Retrieval Techniques), uses i frared markers to collect dat WATSMART operates at a speed 4500Hz and can calculate 3D coorc nates with accuracy of between of and three millimeters. The only drawbacks to WAT MART are its extreme sensitivity light and its wires, which can di connect during quick, forceful mov. ment. WATSMART is now used a most exclusively for numerical ana ysis of motion. 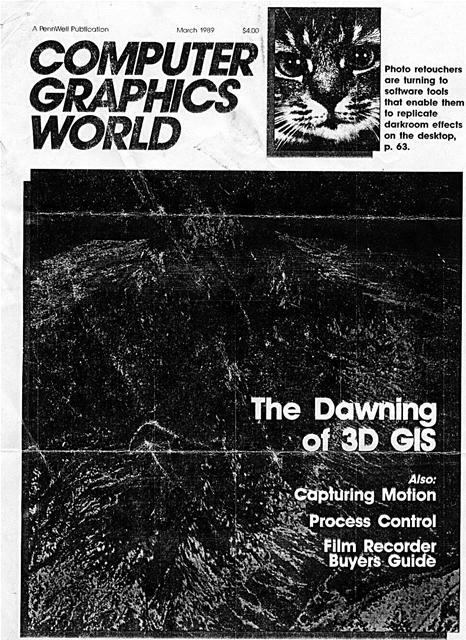 The promise of th and other technologies, howeve could attract graphics software di velopers in the future. Generated on 4/22/2019 2:00:11 PM (PST) ADI/HQ/GBA/2019/ARIELCLOUD/v3.0.2018.0126.